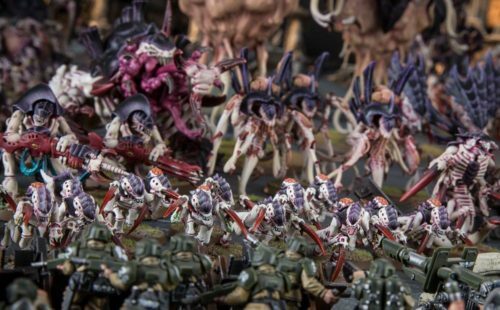 Warhammer Community has posted an article on Hive Fleet Adaptations today, and by the Emperor, they look as terrifying as hell! Well, most of them, anyway. So let's see what they have. Now this is amazing. Especially if you're running a Nidzilla army full of Monstrous Creatures. Getting your dudes into combat is just awesome. 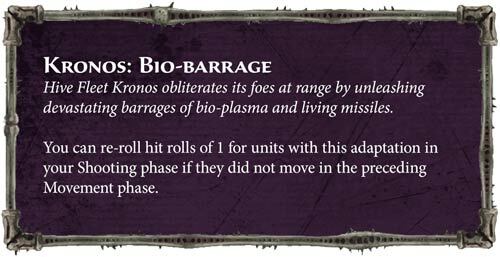 This probably combos with Genestealers who can Advance and Charge, and also those Genestealers or whatever units you have popping out from Deep Strike with the Trygon or whatever subterranean tunnel unit you bring them into play with. 9"? No problem. I'll just re-roll that! This isn't so bad, one thing, because it allows your Genestealers to Advance much further before charging. It also allows any of your Monstrous Creatures to fall back, shoot and charge again, allowing them to strike first every time. Just like my Imperial Knights. Not bad at all. Pretty good, actually, if you ask me. Ah...good old Leviathan. 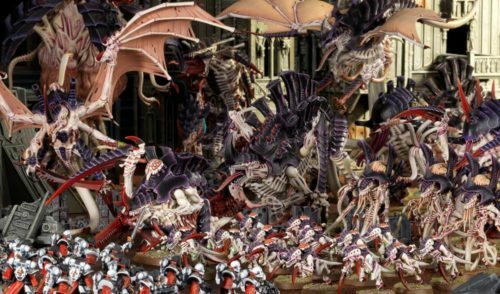 The same Hive Fleet that gave my dear Imperial Guard forces a beating in the Shield of Baal campaign. Ouch. 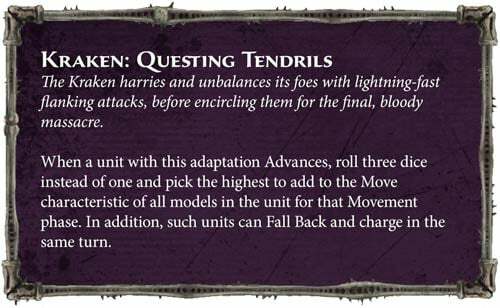 Anyway, that's actually pretty good, and it's not a copy-paste of Graia or that Eldar thing or whatever Feel No Pain doctrine other armies get. You have to be within 6" of a friendly Synapse unit, after all. What puzzles me is that rule lawyers will argue that a Synapse unit will not benefit from this Adaptation unless it's within 6" of a 2nd Synapse unit. Sigh. Fun times. Not too bad, will work for your Hive Tyrants, Carnifexes and other high-strength Monstrous Creatures, and even your little critters will benefit from this since the high volume of dice rolls means you'll roll those 1s anyway. So we get to re-roll them! Yay! This is impressive. 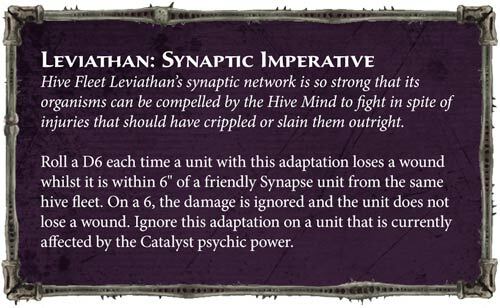 Again, it's not a direct copy-paste of the Skitarii Stygies VIII's forge world dogma, Raven Guard's chapter tactic or that Eldar attribute. 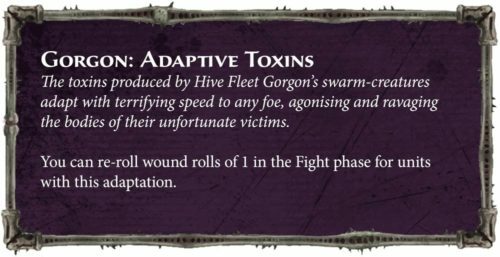 It's original and fluffy, and keeps the feel of Tyranids. Not bad at all. Pretty amazing, actually. Okay, it's not going to help you win the game, but it will make a huge difference against all those low AP weapons. Like my Guardsmen' lasguns. Good old Hydra. We already know this. 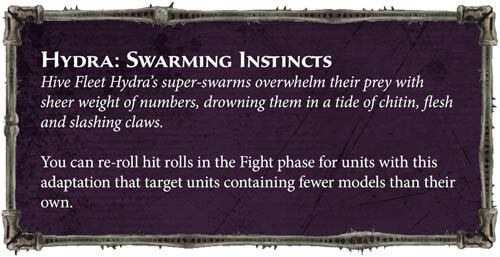 Just keep in mind this only benefits swarms and hordes, and it will not work for Nidzilla lists packed full of solitary Monstrous Creatures like Hive Tyrants, Mawlocs, Trygons and Carnifexes. Just when I was praising the other Adaptations for being original and not merely copying and pasting, they went and ripped Cadia's regimental doctrine off. Really? REALLY?! 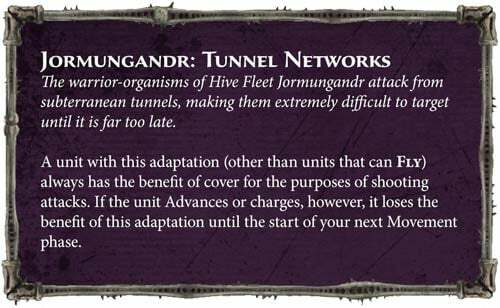 While I love this for my Imperial Guard army, I'm very unsure how this will work for Tyranids. The pathetic range on Termagaunts and most Tyranid shooters are about 24", which means you can't hit anything if you don't move at all! This will only benefit the artillery-type Monstrous Creatures like Pyrovores (I think) and Exocrines. 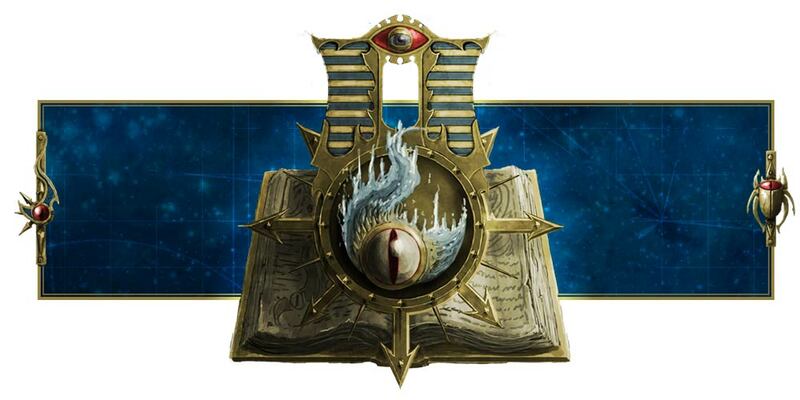 I mean, I can see this working in the form of a Spearhead Detachment, but other than that, I just don't know. Okay, looks like we'll be looking at warlord traits and Bio-artifacts tomorrow, so I'll update you when I get back from college.